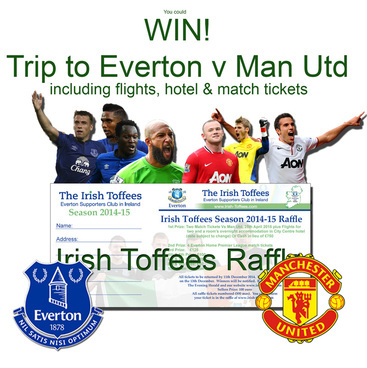 Top Prize: Two match tickets to Everton v Manchester United on April 25th 2015 (date subject to change), plus flights for two and a room's overnight accommodation in Liverpool city centre hotel, or cash in lieu of €750. All posted tickets to be received by December 11th. Draw is due to take place on December 13th. Winners will be notified. Results published in the Evening Herald and on our website www.irish-toffees.com. Seller of top prize raffle ticket receives 100 euro. All raffle tickets numbered individually (500 max). You can confirm that your individually numbered raffle ticket has been received by us and is in the draw by viewing a list before the raffle of all received raffle tickets at www.irish-toffees.com/raffle.html.